Ocala, FL (February 4, 2017) – Team Weber opened the 2017 combined driving season with a victorious performance in the Little Everglades CAI2* on January 26-29 in Dade City, Florida, with three new additions to his four-in-hand team. Chester Weber, three-time World Equestrian Games Silver medalist and 13-time U.S. Four-in-Hand National Champion, did not fail to live up to his reputation as ‘Mr. Dressage’ at Little Everglades. Weber piloted his carefully selected KWPN combination of Boris W, Bastiaan, Splash, and First Edition to a winning score of 35.90 in the dressage phase, taking a firm lead over their closest contender. Swapping Splash for Gouvernor, Weber then delivered a fast marathon phase to hold the lead (143.06) going into cones. In the cones phase, America’s only two-time Royal Windsor CAI3* winner wisely opted to keep the same foursome in harness, and finished with just 6.88 added penalties to their overall score. This resulted in a handy 50-point margin over a coast-to-coast roster of entries. Team Weber’s overall score was 149.94 to secure the win at Little Everglades. “Our focus is now on the national championship at Live Oak International in March. We feel like we had a pretty commanding lead at this last event, so we are feeling particularly bullish going into Live Oak,” said Weber, of Ocala, Florida. The 2017 Live Oak International, held at the equestrian estate owned by the Weber family, will be held on March 9-12. Weber was quick to credit his team and sponsors for his win at Little Everglades. “We are working with a relatively new group of horses. Gouvernor was part of our young horse program – we’ve had him since he was three. We’ve had Bastiaan, owned by Fritz Grupe, since mid-September. This was only their second show. Their last show was at Hermitage, and they have made real progress since then,” said Weber. It’s no surprise to combined driving enthusiasts that Weber took home first place at his first show of 2017, as he closed 2016 as the top-placed American entry at the FEI World Four-in-Hand Championships in Breda, The Netherlands. 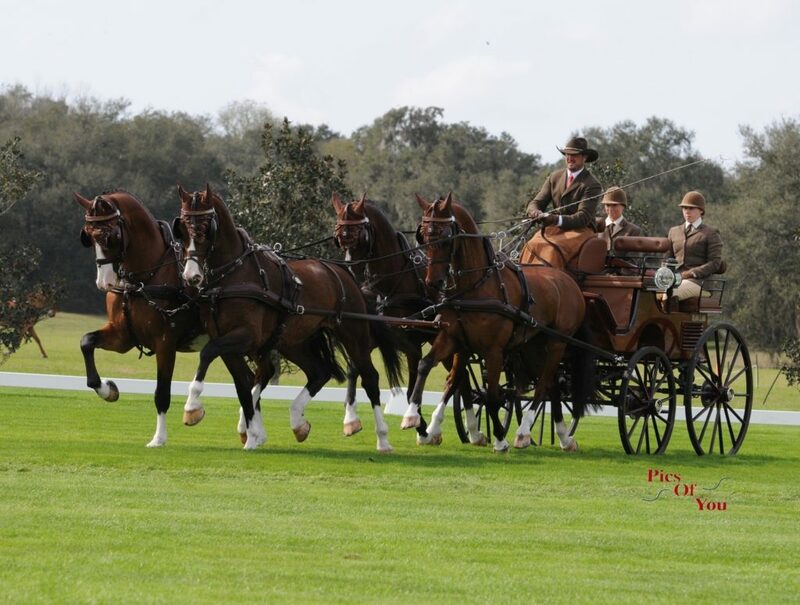 Team Weber will next continue to hone its winning form by competing at The Florida Horse Park Spring Fling CDE/DT/CT (CAC) Driving Competition in Ocala February 17-19. After Live Oak International in March, Weber and his team will forge ahead to Europe to compete at several top sport competitions including The World Equestrian Festival CHIO Aachen, and FEI World Championships for Four-in-Hand. Follow Team Weber’s tournament schedule on www.ChesterWeber.com and learn all about Weber’s latest results, favorite equestrian products, and his star four-in-hand team on his official social media sites on Facebook and Instagram @ChesterWeber.